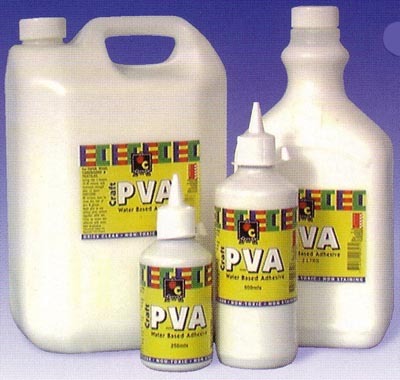 PVA Craft Glue 500ml - Global. New from Global - Excellent adhesion for paper, wood, cardboard, leather, suede and textiles- Dries clear- Non-Toxic- Non-Staining - Suitable for woodworking purposes. 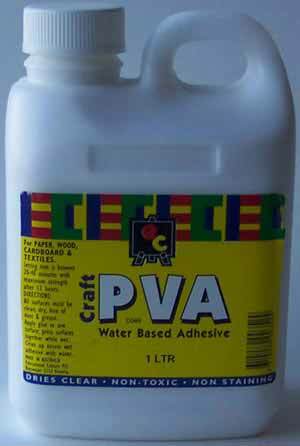 PVA Craft Glue 1 Litre - Global. New from Global - Excellent adhesion for wood, paper, cardboard, leather, suede and textiles. Dries clear- Non toxic- Non staining - Suitable for woodworking purposes - Is an excellent medium for Acrylic Pouring techniques. Aquadhere PVA 4ltr Woodworking Glue Suitable for end grain gluing- Non-Staining- Non-Toxic- Dries clear. 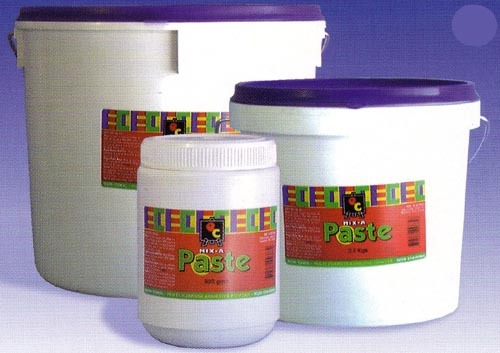 Adhesive Paste Clag 5 Litre - Traditional paste glue for paper and cardboard. Supertac 550ml Adhesive Multi purpose- Non-Toxic- Non-Staining- Ideal for fabric, wood, metal, glass - Dries quickly and clear. When other adhesives just won't hold - Supertac it! Clear Craft Gum 250ml - EC - Educational Colours - Non-Toxic liquid- Dries to translucent flexible film- Strong bond on paper, card, fabric and collage. 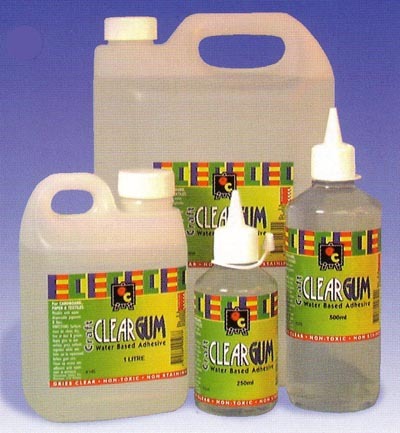 Clear Craft Gum - 5 Litres - EC - Educational Colours Non toxic liquid - dries to a translucent flexible film. Strong bond on paper, card, fabric and collage. Craft Glue - Helmar 125ml - A high performance solvent based, premium Craft glue (40% Solids content) which sets quickly and dries crystal clear. 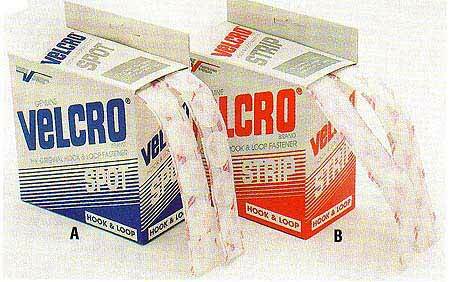 Ideal for almost all types of fabrics, leathers, balsa, paper, cane and more. Excellent for lampshade making and millinery work. Craft Glue - Helmar 250ml - A high performance solvent based, premium Craft glue (40% Solids content) which sets quickly and dries crystal clear. Ideal for almost all types of fabrics, leathers, balsa, paper, cane and more. Excellent for lampshade making and millinery work.